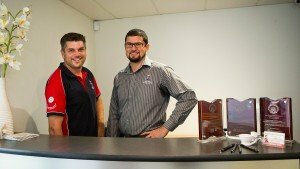 The directors of Quality Plumbing and Gas, John and Marcos have built up Quality Plumbing and Gas from humble beginnings back in 2000, to a team of 8 dedicated staff that are known to over deliver for each client. Marcos Gonzales started out as an apprentice at the age of 16. From working on housing commission homes, to multiple businesses, Marcos has acquired the knowledge and experience to deliver the best service and products to his clients. John Brown and Marcos Gonzalez’s combined experience and knowledge make them a winning combination year after year. Being a member of the Master Plumbers Association, John and Marcos must meet strict criteria on a regular basis. In 2009, Quality Plumbing and Gas was awarded the ‘Maintenance Business of the Year‘ by the Master Plumbers Association. In 2010, they were awarded ‘High Commendation‘ by the Master Plumbers Association. Formerly located in Gooseberry Hill and now with an office in Kalamunda, Quality Plumbing and Gas has worked long and hard to be recognised by the Master Plumbers Association as one of the best plumbing businesses in Perth time and time again. Marcos and John have established Quality Plumbing and Gas over the years with the assistance of office staff, ongoing training and loyal customers that rely on them for honest service and quality plumbing and gas products.